Jan and I just looked at the last posting and saw the date, March 16th!!! So, we will try to catch up at least a little today. From Alamogordo,New Mexico on Route 54 , we head north to Tularosa and then northeast on Route 70 towards Ruidosa Downs and then Roswell. Yes, that Roswell--aliens and all. From there, it is south on Route 285 to Lakewood and our membership park, The Ranch. Nice people in a quiet setting. If you look at the New Mexico map, you will see that we have traveled a large loop from Las Cruces up around and back down further east. We tried stopping here in December, but it was freezing with snow. 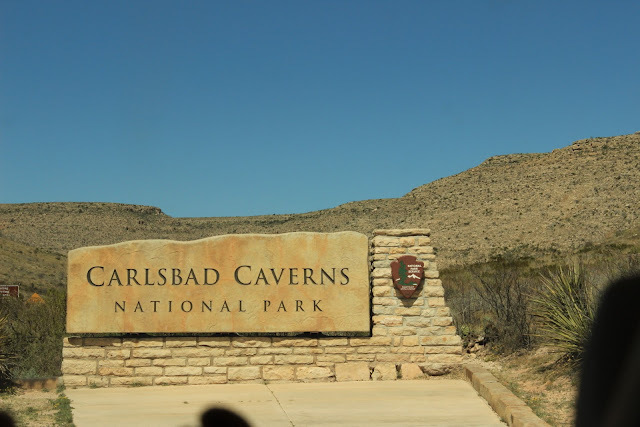 Carlsbad Caverns National Park is one of the deepest, grandest, and darkest caverns ever found. Some people feel it is the eighth wonder of the world. It requires a long hike down of 800 feet in one mile(the elevators were not working). There are 120 caves and you must be in good condition to enter. Carlsbad alone is 30 miles long and the Big Room at Carlsbad is 8.2 acres.!! to watch a few hundred thousand bats fly out for their night time feeding. Looking back up at the entrance before we are in the dark. Click to enlarge and note all the people on the path. Or is it from an alien movie?? you will see little, tiny people on the far pathway. 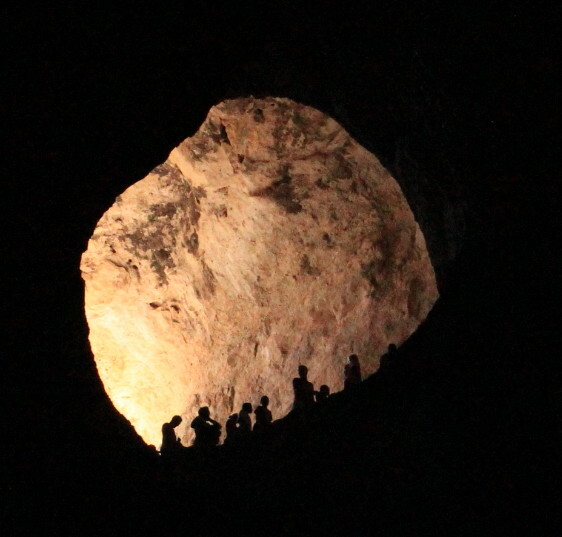 It is dark in the caverns and the camera was working hard to find light. More formations and people on the near walk and in the distance. Pictures do not give you the full size of this cavern. You can find other pictures on Carlsbad websites. But, if you ever have a chance, definitely go. 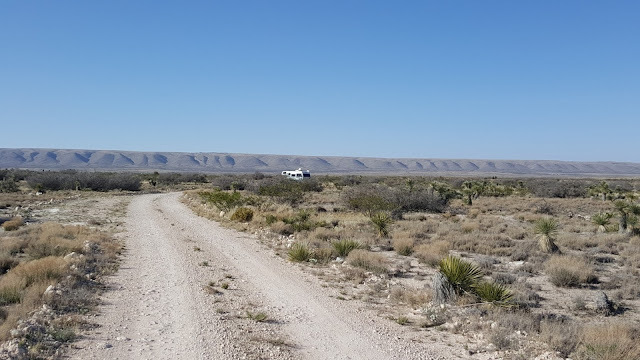 The Guadalupe Mountains National Park is very close to Carlsbad. Carlsbad and Guadalupe are at about 4500 feet. Guadalupe Peak, 8,751 feet, is the highest point in Texas. Carlsbad is in New Mexico, but they are only about 50 miles apart. Beautiful country . Lots of hikers. Jan takes a view from the visitors center. Note, it says " not to be feared" Right. The first settlers were in the late 1800's and then a family moved in in 1906. The Smith family had a small truck farm. They raised vegetables and an orchard. The produce was brought by wagon 60 miles to Van Horn , Texas. I found this fascinating. In the backyard is still this metal housing for a gas generator. The diagram shows how calcium carbide became acetylene gas which was piped into the house for lighting. A spring was directed near the house and water was pumped in by a hydraulic ram. Pretty comfortable living in the desert in 1906. Even in mid-March there are colorful tiny flowers. 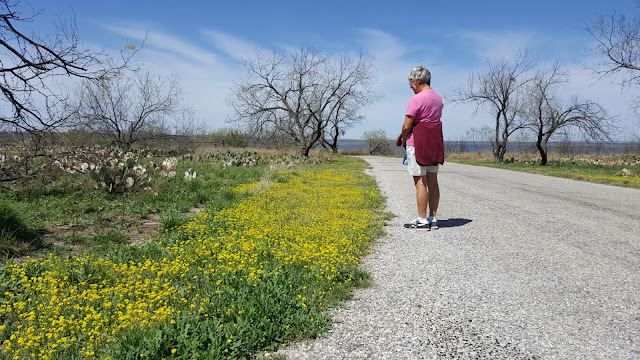 Jan and I did a nice hike around the ranch. This was a route from St. Louis, Missouri to San Francisco, California. A distance of 2,700 miles and the contract stated it had to be covered within 25 days. The stations were bout 20 miles apart and they traveled 24 hours a day. Stops for food and water , like here at Pinery Station , and change horses or mules, and on again. A few cattle ranch workers. A stop at the BLM office in Carlsbad and Jim enthusiastically maps us to this spot just a few miles south of the Carlsbad entrance. Nobody here but us, see Lady Blue above. A good test for our new solar setup. The test is very successful for three nights! Everything we could use, we did! Satellite TV, Satellite Radio, full electricity for lights and charging. And fully charged batteries when we leave. Such a great camping spot and free! Routes 180 and 62 and then east. Along the way , lots of potash processing and oil fields. number one for oil, cotton, and peanuts. A stop for the night in Big Spring and then south to San Angelo State Park on Route 87. This is still March in Texas. But there are lots of signs of Spring. The yellow are basically weeds, but they look great. 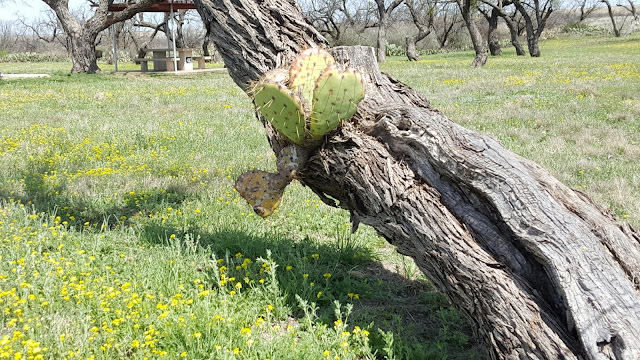 There are prickly pear cactus all over, but we do not remember a cactus growing out of a tree? 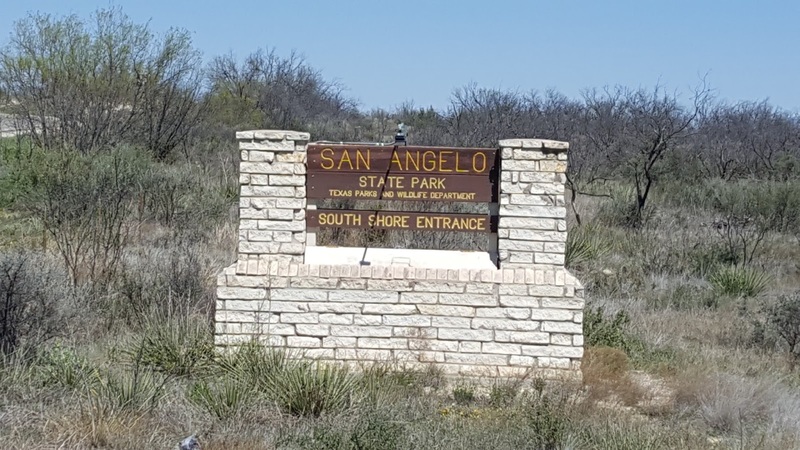 The next stop on the way is Inks Lake State Park. We had stopped here on the way west in December. 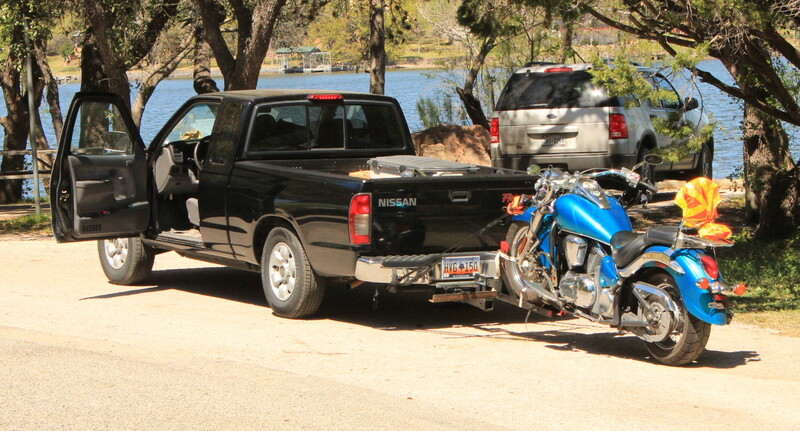 The routes were 71 to Llano and then 29 to the park in Burnet. As we head into Texas Hill Country on March 23rd, we remember that this is around the time for the famous Bluebonnets to come into bloom. At first , just a hint of color. 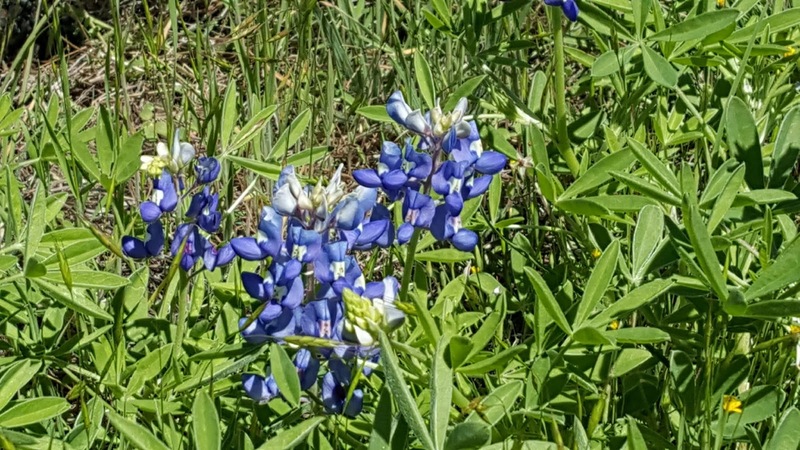 And then, just blankets and blankets of Bluebonnets mixed in with red Indian Paintbrush. On weekends these roads will be like Fall Foliage in New England. You can see what sets these flowers apart. With so many together, the white tops make them jump out. Many more in the state park as well. Cooper's Barbeque. We still say one of the best. We had never seen a large Harley Davidson towed this way. This is a small truck. After about an hour to hitch it up, the front wheels are almost off the road. The license plate is North Carolina and we were hoping he didn't have to drive that far. In the park. No , this is not an antique. 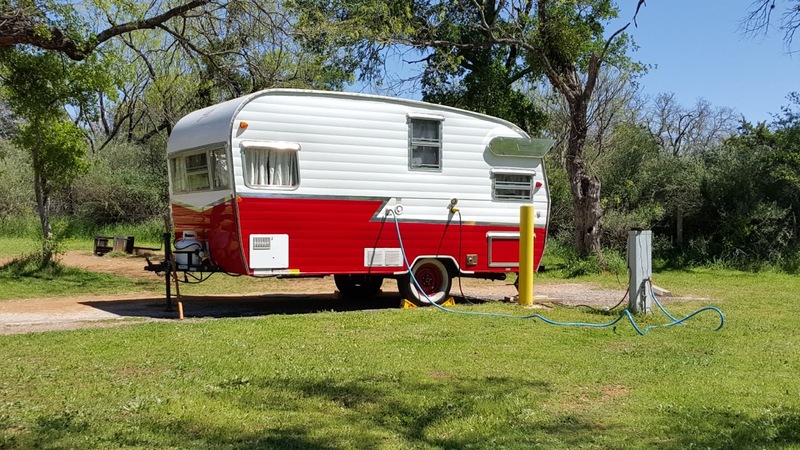 This is a new reissue of the Shasta trailer from about the 1960's. Starting about here, we are definitely out of the desert. Lots of green trees , grass, and bushes. After three months plus, Lady Blue and Eustis are also happy to see green again!